Just wondering if you might have known of somebody who is having the same problem that I am, and if so, what did they do? I’m on the eighth week of training for my first half marathon. My 3 mile time is almost a full two minutes slower than what it was four weeks ago: 29:49 vs. 27:59. I know both times are slow but I figure I should be improving. You need to relax and let the program carry you along. We’re at the end of the usual Very-Hot-Summer, when times often are slower, often much slower. I ran a couple of 5-K races recently about a month apart. My time in the second race was several minutes slower than my earlier time despite the second having an easier course. The reason was weather. Heat drains us, not merely in races, but in the workouts leading up to races. Another factor involves the structure of most training programs, including almost all of mine. As week piles onto week, they get tougher. My Novice 2 Half Marathon program begins in Week 1 with a 4-mile long run and peaks one week before the race in Week 11 with a 12-mile run. 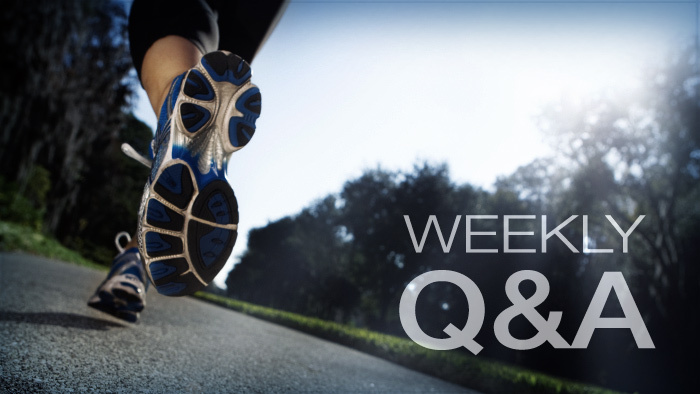 The mid-week runs on Wednesdays, go from 3 to 5 miles, a subtle change, but one moving relentlessly upward. As we run more miles, yes, our fitness improves, but we also need to slow. Nobody can run a mile at the same pace as they can run a marathon. Maybe you need to leave your watch at home when you run. Don’t worry about time or “improving.” Worry about finishing the program while looking forward to your half marathon race.